After 3 Years of Waiting the Perfect Storm is on the Horizon & the 2019 Red Bull Storm Chase is ON! Red Bull Storm Chase, the world’s toughest windsurfing contest, is about to get started! After three years of waiting and watching, we’ve got a serious storm on the horizon. The green light is lit, and we’ve hit the point of no return – Red Bull Storm Chase is ON! March 7th – Flights were booked and arrangements made. Eight of the world’s best storm sailors are headed to Dublin for what will unquestionably be a spectacular moment in windsurfing history, as a massive low-pressure system approaches the coast of Ireland. The riders will be arriving over the next 72 hours, taking last minute flights from all over the world with plenty of gear in tow. The current forecast calls for a series of squalls to hit the Irish coast beginning Saturday, with two big systems on the way for early in the coming week. Wave heights are predicted to reach 10m, ensuring plenty of high-flying action – and plenty of gear carnage. Temperatures are expected to hover around 5 degrees celsius making for even tougher conditions. The precise format of the contest will be determined on location to take maximum advantage of the conditions, but no question the panel of expert judges will be rewarding big jumps, aerial artistry, and of course, stylish wave rides. Coming for the fun are three former Red Bull Storm Storm Chase podium winners – Leon Jamaer (JP / NeilPryde) from Germany, Dany Bruch (Bruch Boards / Flight Sails / AL360) from the Canary Islands, and current champion, French windsurfer Thomas Traversa (Tabou / GA Sails). They’ll be joined by five more competitors, all ready to take on the storm: UK local Adam Lewis (Fanatic / DuoTone / SWOX), Maui-based Robby Swift (JP / NeilPryde / SWOX), Venezuelan Ricardo Campello (Brunotti Boards), Australian Jaeger Stone (Starboard / Severne / SWOX / Shamal Sunglasses), and Red Bull athlete Philip Köster (Starboard / Severne / Maui Ultra Fins). As the crew will make last-minute decisions depending upon whether the storm system heads north or south, precise timing and location is not yet determined. Fans and media should stay tuned to the Red Bull Storm Chase Facebook page and Instagram to get the latest updates on-the-spot as action unfolds. 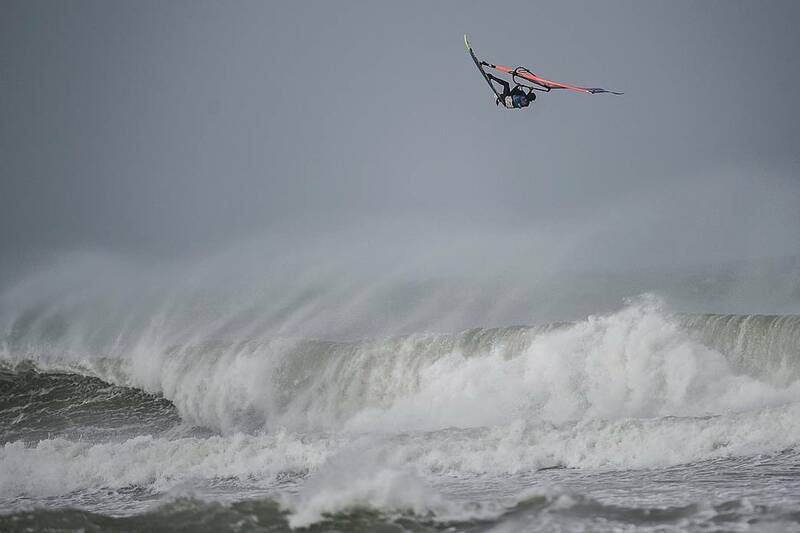 - The world’s toughest windsurfing contest – competition is now confirmed! The location will be chosen for impressive sailing conditions, presence of adequate medical coverage and emergency services, and an absolute guarantee of water access. Full safety crews consisting of watersports and medical professionals will be onsite to assist in the event of an emergency. This press release offers approximately a 72-hour warning. Riders and event crews are en route to Ireland. Pre-, mid-, and post-event, updates will be available online at Facebook.com/redbullstormchase.